WASHINGTON | TEXAS: Donald Trump’s decision to bid “bye bye” to House Speaker Nancy Pelosi and storm out of a White House meeting brought relations between the president and Democrats to a new low just as the impact of the nearly three-week government shutdown was set to intensify. The breakdown came just two days before some 800,000 federal workers will miss their paychecks, spreading financial pain to families across the country. Far from a compromise to end the standoff, Trump heads to the US-Mexico border in Texas on Thursday to rally support for building a wall, the central issue in the standoff. Trump may bolster his base with a trip to the border but he’s unlikely to sway the Democrats he needs to secure the $5.7 billion to build the wall—a key campaign promise. While the president has so far kept most Republican lawmakers from defecting, that is being tested as the fallout from the shutdown becomes more tangible. Democratic leaders, meanwhile, say they won’t negotiate until the president reopens government. 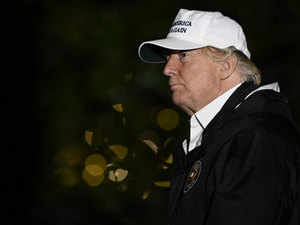 The abrupt end of Wednesday’s meeting in the White House Situation Room followed by the acrimonious remarks from both sides left little hope for a breakthrough anytime soon. Trump held firm to his $5.7 billion proposal, but asked Pelosi whether she’d support building a wall 30 days after he agreed to reopen the government, according to a person familiar with the matter. When she replied that she wouldn’t, Trump said “bye bye” and left the room. The discord highlighted the prospect that Trump would try to end the impasse by invoking emergency powers in an unprecedented bid to circumvent Congress and fund construction of the border wall. Just hours before the meeting, Trump told reporters he “may go that route” if he was unable to work out a deal with Democrats.